The primary deposits may be conveniently but to some extent artificially grouped as (1)veins of the zinc-lead-silver-gold series,(2) stockworks and veins of the gold-silver-lead series,(3) the gold veins of Farncomb Hill, (4) veins in the pre-Cambrian rocks, 5) metasomatic repiacemcnts along bedling planes, and (6) gold-silver deposits in quartzite. The gold veins of Farncomb Hill are remarkably narrow fissure veins that traverse Upper Cretaceous shale, with some sheets of porphyry, and contain isolated pockets of crystalline native gold in a limonitic matrix. The productive veins all lie on the north side of and near a considerable mass of quartz monzonite porphyry, which forms the core of the hill. 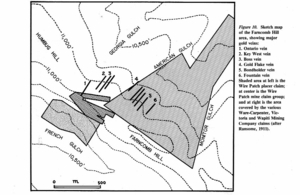 The rich pockets are confined to a comparatively superficial zone, which probably nowhere exceeds 450 feet in extreme depth from the highest point on the outcrop to the bottom limit of the ore. Their formation appears to have been connected with oxidation and was favored by the structure of the shale, porphyry, and veins, particularly by the slight dislocation of the veins by slips along the bedding planes of the shale. In their original condition the veins probably contained pyrite, chalcopyrite, sphalerite, and galena in a calcitic gangue. The Farncomb Hill veins owe their rich pockets to the cooperation of Rulphide enrichment followed by solution and segregation of the gold in the zone of oxidation. In Volume 18 of the January-February publication by the Minerogical Record, Gold!, Farncomb Hill Gold is discussed in detail. "Fine Farncomb Hill gold specimens are among the most treasured and sought after specimens in the world. The good ones are relatively rare, but that is the case with all minerals. The scarcity is somewhat remarkable, however, when one considers how much Farncomb Hill gold is said to have been saved from the smelter and kept as specimen material. Apparently many of the oldtimers knew they had something special. There are three principal habits of Farncomb Hill gold: leaf, wire, and spongy arborescent growths. Combinations and variations also exist in several forms. By far, the best place to study Farncomb Hill gold is at the Denver Museum of Natural History, which houses John F. Campion's gold collection. This collection is one of the truly great special collections in the mineral world. The variety, overall quality, method of display and aesthetic appeal are remarkable....Leaf gold is far and away the most commonly seen habit for Farncomb Hill material. It also is perhaps the most aesthetic of all the habits when observed as truly fine specimens. The leaves are almost invariably composed of distinct gold crystals. Most crystals are flattened octahedrons displaying a hopper or skeletal habit. The crystals are always arranged in parallel growth over most of the leaf surface. Crystal size varies from less than a millimeter to 1cm (rare! ), but most are from 1 to 2 mm. The leaves are usually 1 to 2 mm thick, and vary in length up to 15cm on large and truly outstanding specimens."